In this episode, Carrie is disturbed because a certain French architect with whom she has a short romantic fling, mistakes her for a call girl/prostitute. What I found more disturbing than that is poor Skipper. Meet Skipper, the twenty-something year old sensitive soul that Miranda reluctantly dates for lack of a better option. All around it's a sorry situation. Skipper is so much in love and his relationship with Miranda is so one-sided that he has no power at all in the relationship. 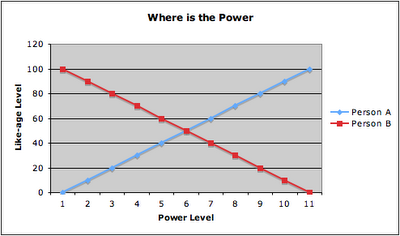 I believe that in relationships, power is inversely related to emotion. Assuming that there is a sum total of 100% of like-age in the relationship. The more you like someone, the less power you have. So, if you like someone 10% but that person likes you 90%, the more power you have over the other person. With Miranda and Skipper, it's about Skipper 99.99% and Miranda .01%. Miranda has absolute total control over Skipper unless he realizes his sorry situation and gets the hell out. Sadly, he doesn't seem to realize that and he has started to do the Self-Sabotage. "She's got me totally whacked. It's like I'm obsessed. And I know that I shouldn't be because I can sense that it's totally turning her off. But I can't control it. I can't. It's like she's got this power over me... and I'm helpless." I've usually witnessed this crazy behavior with females, even my girl friends. But Skipper epitomizes it well. Why are you acting crazy? Why are you smothering the other person? You know that she/he will freak out that you sent them Psycho Message X or Psycho Gift Y. Why are letting yourself be psycho and obsessed? It's because you know the other person doesn't like you as much as you like him/her, and you are scared that he/she will leave. But that's absolutely not a reason to act psycho. Trust your instinct and if anything, have some pride! If your instinct tells you that you're smothering, don't do it! Don't blame the other person for his/her "power over you." Your'e doing it to yourself! Your'e self sabotaging! Don't be a Skipper. Don't Self Sabotage. It ruins 100% of the relationships it touches.